Diaper Changing Stations | Breezy Mama Breezy Mama - Expert parenting advice, celebrity interviews, product reviews for kids, moms and babies and more! WIN! 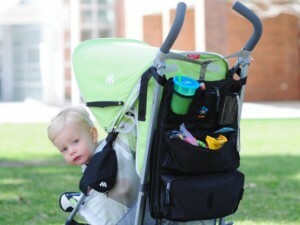 Zoobi is giving away one of their fabulous stroller organizers/changing stations. See bottom of post for more details. Oh the dread! You’re out and about and your child poops. Now, you have to find a place to change the diaper, hoping that “the place” is relatively clean, only to find that you are out of diapers or wipes–or the worst–both. No longer my dear diapering friend. Get one of these portable changing stations and you’ll never be caught unprepared again. . . This fabulous little get-up (above and picture at intro) is great because not only is it a changing table, but it’s a stroller organizer and diaper bag as well. The bag unfolds and clips on to your stroller–it has pockets for anything you’d ever need, plus two cup holders. When you want to use it as a diaper bag, take it off, clip it together, and carry it by the purse strap. And, when it’s time to change that diaper (or if you just need a play mat for baby) unzip the outer edge to reveal the changing mat. So many things in one, you’d think it would be bulky. But no, the Zoobi is as compact as they come. Truly fantastic! Zoobi Ultimate Stroller Caddy and Carry Tote, $19.95. Click here to order. 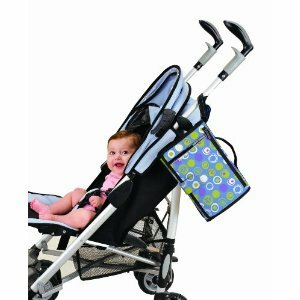 This handy changing pad folds up small so it can fit in the bottom of your stroller or it can fasten to your purse. There’s a zippered outside pocket for your personal items and interior pockets to hold your diapers, wipes and other essentials. The whole thing unfolds revealing a big changing pad with a little cushion for your wee one’s head. The changing pad also detaches so you can bring one without the other, which is a cool feature if you carry a diaper bag and just need a pad. Munchkin Designer Diaper Change Kit, $14.99. Click here to order. What makes this station different is that it’s made for the back of your car–a SUV, minivan or any other hatch back vehicle. I use it in the back of my station wagon and it works great. The station has a changing pad which, when you unfold, reveals three pockets. In my Dipe N’ Go I have 3 diapers, a small case of wipes, and a onesie and leggings for emergency use. Holding all of that, the velcro fastener stays attached to the car! I love this pad because I am constantly changing my daughter in the car–and the Dipe N’ Go offers a clean place free of sand. Dipe N’ Go Changing Station, $14.97. Click here to order. More a wipes case than a changing pad, this handy box holds all you need while on the go. One side of the case holds your wipes, which you can access from either the outside (when you need to clean some grubby hands) or the inside. The other side holds a folded changing pad and diapers, and features a flexible “clip” to hold everything in place. There’s also enough room for one small bottle of hand sanitizer and disposable bags. The entire thing can fit in your purse or in your stroller basket. They also have some adorable designs–for both boys and girls, as well as unisex patterns. b. box, $25.00. Click here to order. Stay informed. Subscribe to receive the Breezy Mama newsletter four days a week. Plus, be entered to win a $50 gift certificate from Kinderbliss AND shoes from Pediped. To sign up for free, click here. WIN! 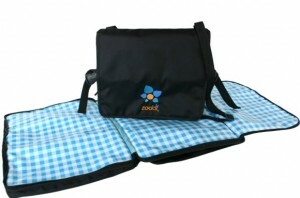 Zoobi is giving away one of their fabulous stroller organizers/changing stations. To enter, tell us what you currently do when you have to change a diaper while your out and about–do you carry a changing station? A blanket? Or do you just put the kiddo down on the restroom changing table as I’ve done way too many times? One winner will be picked at random. When I need to change my daughter in public. I either use the back of my SUV or I use her stroller since public bathrooms are less than desirable for me, not to mention my daughter. i have the munchkin diaper kit featured above because it does fit in all of my handbags. however, i love the one fitted for the trunk…registered for the next baby! thanks! We just use a regular old changing pad… nothing as cool as this! I lug my diaper bag everywhere we go and use the changing pad that comes with it. But if we’re in a public restroom, I’ll usually put a disposable changing pad down first so I can keep my changing pad as sanitary as possible. I’ve been known to plop the twins down bare but in the grass at the park to change diapers. If we’re going to the mall I normally just throw a couple extra diaper and some wipes into my purse which might as well be a diaper bag. My purse has been completely taken over with toys, pacifiers, games, crayons….you name it! I left my yoga mat in the van one day when there was a diapering emergency. I rolled out the mat and realized it just became the nicest, cushiest, largest, easiest to clean changing station, so now it resides permanently in our van for just this purpose. I always have extra diapers and wipes in the van anyway, so we never use public restroom changing tables anymore! It depends on where we are and how immediate I need to change it (poop or pee). If we’re close to the car, I’ll pop the trunk and do a quick change in the trunk. Otherwise, it’s on the bathroom changing table. I try to make sure I have a blanket or changing pad on hand with diapers and I use that. If there’s a changing station in the bathroom I cover it and use or it there’s nothing I look for the cleanest place and at neck-breaking speed remove/re-diaper and wash both our hands. If my husband is around, I use his knees as a changing table. My son gets a kick out of it, and it’s about the only time he’ll stay still! I always carry a changing pad in my diaper bag. I read an article once that said that those changing stations are swarming with all kinds of nastiness, so I got freaked out. I’ve also changed him in his stroller and in the car. We use a changing pad that we carry in our diaper bag. It seems to be sufficient, but the tools listed above sound pretty cool! When im out and about with my 4 month old i kug around the biggest diaper bag you have ever seen! making sure i have enough diapers, PLENTY of wipes, creams and a change of clothes with the diaper pad that came with the bag and disposable diaper pads too when the restroom looks “ify”. We have even had to both go into the restroom and hold her standing up to change her bc the restroom was unsatisfactory. Thhis product would be GREAT to have.